Check out highlights from last night’s episode of NXT, featuring Matt Riddle v Kassius Ohno, and the nominees for the best of NXT in 2018.
Who will take home the 2018 Female Competitor of the Year Award: Shayna Baszler, Nikki Cross, Ember Moon, Kairi Sane or Bianca Belair? Video courtesy of the award-winning WWE Network. From Mia Yim to The Forgotten Sons, see which Superstars are in contention for the Future Star of NXT Award. Video courtesy of the award-winning WWE Network. Tommaso Ciampa, Johnny Gargano, Aleister Black, Pete Dunne, Ricochet, Adam Cole, Velveteen Dream and Andrade “Cien” Almas are up for the Male Competitor of 2018 NXT Year-End Award. Video courtesy of the award-winning WWE Network. Meet the duos competing for the Tag Team of the Year honors in the 2018 NXT Year-End Awards. Video courtesy of the award-winning WWE Network. Which Superstar deserves to be called the Breakout Star of 2018 in the NXT Year-End Awards? Video courtesy of the award-winning WWE Network. 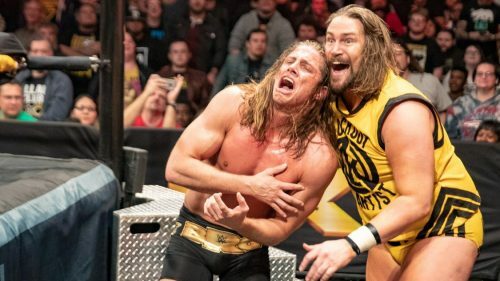 An angry Kassius Ohno tries to even the score with red-hot newcomer Matt Riddle in a TakeOver rematch. Video courtesy of the award-winning WWE Network.